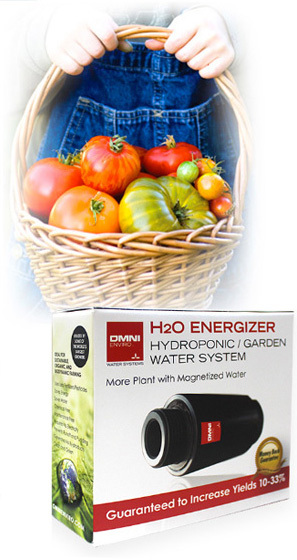 Omni Enviro Water System’s H2O ENERGIZER is a boon for greenhouse and indoor gardening. It produces healthier, more productive plants, while reducing the materials and labor usually employed to achieve that goal. With this technology, the natural vitalizing process that occurs in melted snow water as it runs over miles of streams now happens in an instant with any water. The H2O ENERGIZER uses proprietary magnetic inductions to restructure water molecule clusters into their most simple symmetrical and productive form: six water molecules per cluster. This basic hexagonal molecular structure is the most biofriendly—and therefore most bioavailable—form of water for living cells. The H2O ENERGIZER dramatically increases hydration, the key to plant health and productivity. It delivers more oxygen while diminishing toxins. The result: larger, healthier plants with a marked increase in yield and quality. The H2O ENERGIZER, through magnetic resonance, makes any water—and every plant—healthier and more productive. It reduces nutrients to smaller, more bioavailable units that more efficiently enter the plant cells, thus allowing for the reduction of fertilizer. It reduces salts in the soil and eliminates scaling. The increased vigor of the plant enables a reduction in pesticides. The H2O ENERGIZER needs no maintenance or cleaning, or power to drive it. It is guaranteed for ten years, though it should last in excess of fifteen years. The guaranteed benefits of the H2O ENERGIZER have been proven dramatically in the field and in testing. Beyond the benefits already stated, it improves soil pH, reduces Total Dissolved Solids (TDS), decreases heat stress, and improves water flow by reducing viscosity and friction. It won’t allow run-off or puddling, and generates no by-products. It’s clean and green. For inline installation, put the H2O ENERGIZER immediately after the pump. For manual feed, connect it to the end of the hose.